I’m excited to be here at Killer Characters among such great company. My name is Rita Lucero, and I’m a trained pastry chef and cake artist. When my almost-ex-husband died last year, I moved to New Orleans and took over running the specialty cake shop he opened when we separated. It wasn’t my idea to take his place, you understand. His mother insisted, and I agreed for several reasons, not the least of which is that she needs me around. But in all honesty, running Zydeco Cakes is my dream job and that doesn’t exactly hurt. So far, I’ve loved every minute of it. That doesn’t mean that adjusting to life in the south is a piece of cake, though. I grew up in Albuquerque, raised by an uncle and aunt after my parents died. I’m used to desert air and wide-open spaces, so the climate, the culture, the accents, and the never-ending party atmosphere in New Orleans are both exciting and a little overwhelming at times. And then there’s my mother-in-law, the indomitable Miss Frankie Renier who is also my business partner at Zydeco. Even though Philippe and I were within hours of finalizing our divorce when he died, Miss Frankie clings to the belief that we would have reconciled if he hadn’t gotten himself killed. I love her. I truly do. But let’s face facts: losing her only son has left her a little unhinged. And she’s not the only one who makes my new life interesting. Not by a long shot! Between the staff at Zydeco, the crew at the Dizzy Duke, our local watering hole, and the seriously hunky homicide detective who investigated Philippe’s murder, life in New Orleans is never dull. If you get a chance, stop on by and see exactly what I mean. Looks like life will be exciting in the coming days. Wow, Dru, you're up early! Yes, life will be pretty exciting for Rita and her friends and family. She'll be celebrating her first-ever Mardi Gras in February, which I hope is lots of fun for readers. Mardi Gras in February? I'll be there to visit Rita and her friends! This is such a great read, I loved it! 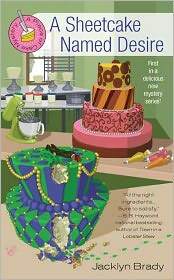 Looking forward to reading about it... my favorite shows on the Food Network are often the cake decorating challenges!! Thanks so much Kaye and PJ. I'm so glad you enjoyed the book. And Victoria, I love the cake decorating challenges too. I hope you enjoy the book as well. Waving at Jacklyn...now, why does this book sound familiar? It's a great read, folks! I can't wait to read this! Sounds delightful. Sounds like we have a lot in common, Sonia! Waving back at Sheila ... love your series! Just stopping by to add my kudos. This is a great read! I highly recommend this book and look forward to Rita's next adventure in cake baking. YUM! Thanks Dorothy! And while you're here, I'll toss an enthusiastic plug out there for your book! I really enjoyed Flowerbed of State and can't wait for more. Honey, you had me at cake. The rest is all icing and it sounds like a delicious life and a great read. I live about 20 minutes from downtown N.O. I am currently reading this book on my Kindle app. Jacklyn, have you ever lived in N.O. ?